On Sunday, I had measured out all the dry ingredients, cubed the butter, and sliced the scallion for the shortcakes. This was going to save me a little time Tuesday night, when we were originally going to make the shortcakes, so I was able to jump right into making them on Saturday. I used a pastry blender (my first time) to cut in the butter and I was surprised how easy (and efficient) it was to get the flour mixture to the desired texture of coarse meal. I add the milk and it really started to look like shortcake dough! It was easy to shape the dough to the desired thickness of about an inch. I found that dipping my biscuit cutter into a little flour made it very easy to cut the shortcakes out of the dough and drop them onto the parchment lined baking sheet. I only had to reshape the dough once and was able to get six shortcakes out of it. While the shortcakes were in the oven, I made the tomato salad, which was very colorful and summery-looking and only took a few minutes. I very much agreed with the step of rotating the shortcakes mid-way through baking, but be careful—mine really slid around on the parchment paper and I almost lost one! I used the rest of the baking time to clean up the kitchen and start to think about plating. We plated two shortcakes each as we didn’t have much for breakfast. We split them in half, added a dollop of whipped goat cheese and a few big spoonfuls of tomato salad, and had a delicious and filling lunch, which we paired with a small glass of white wine left over from earlier in the week. 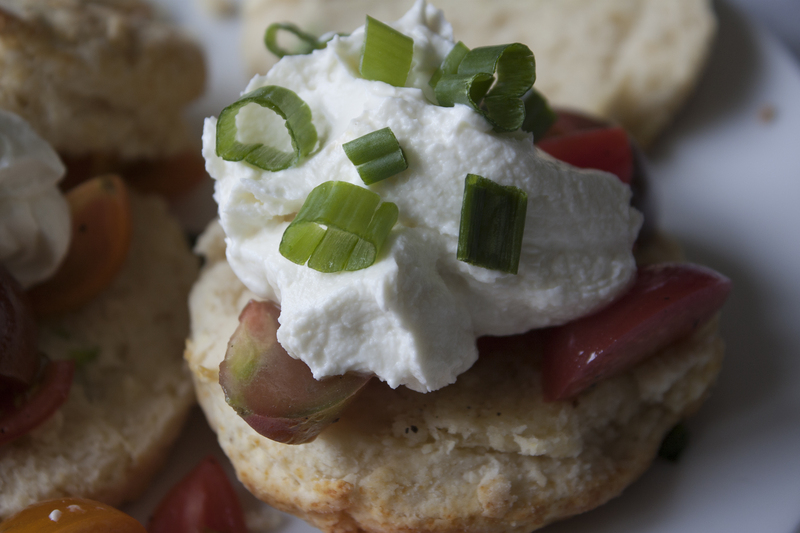 We had a couple of biscuits and a little goat cheese left over, which made for a nice, light brunch the next day. I think with the approach of measuring out the items for the biscuits and perhaps making the whipped goat cheese in advance, this could definitely work as a weeknight meal.